Gangadhara Gives New Life to Hyderabad Roads. 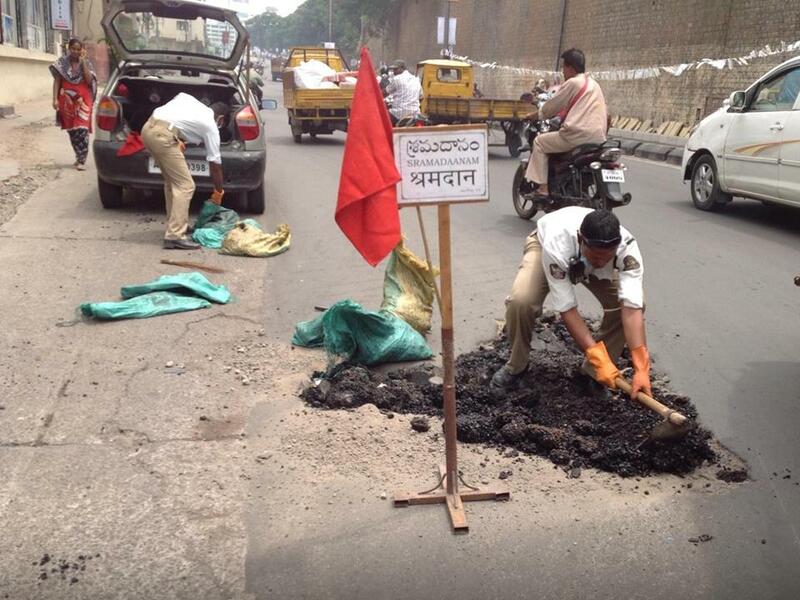 Fills 1500+ potholes. Home Influencers 71-Year-old Gangadhara Tilak Gives New Life to Hyderabad Roads. 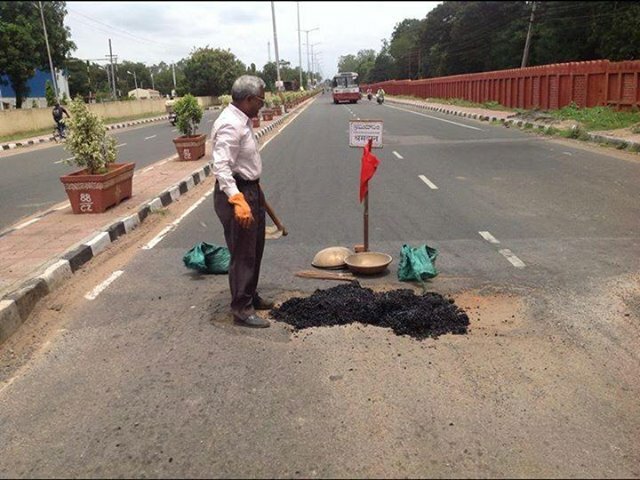 71-Year-old Gangadhara Tilak Gives New Life to Hyderabad Roads. A man, who did not crib about the deteriorating conditions of the roads. Instead, he did something about it. He is the man who did not wait for the Government to do its job. 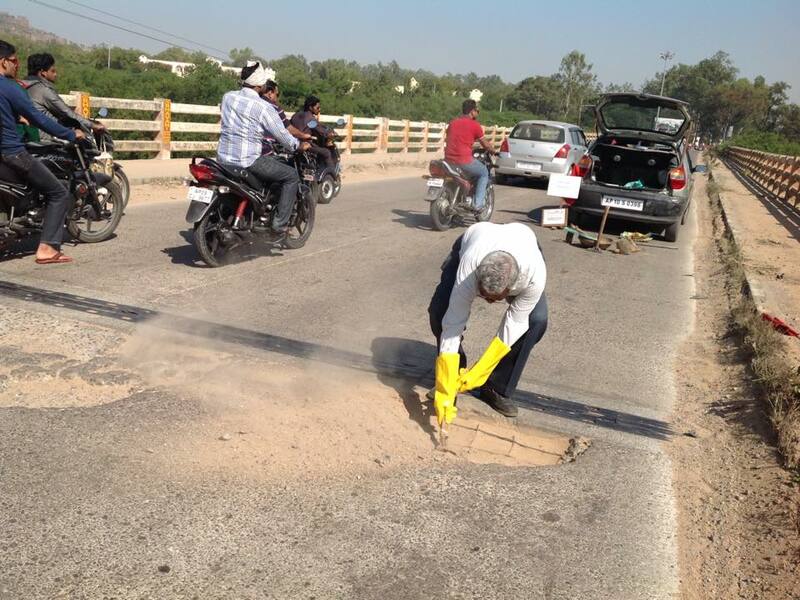 As a responsible citizen, he voluntarily has been filling more than 1500 potholes of the Hyderabad streets. Gangadhara Tilak Katnam is a retired Software engineer of the Indian railways. Hailing from a small village of Godavari district, he led a typical common man’s life. Taking a good education, devoting his life to his job, raise a family, and then retiring peacefully. His story would have been no different had he not experienced this simple incident that changed the course of his life. He was once driving his car which fell into a pothole and the muddy water splashed on a few school-going kids walking nearby. He was left ashamed that being a regular tax-payer, he could not even have access to basic good roads. The incident was ingrained in his mind. When he read in newspapers about lives lost in bike accidents because of potholes and witnessed a few accidents himself, he instinctively appealed to the responsible government authorities to take appropriate measures. Of course, as we know with our Govt, his pleas were not responded to. Probably it wasn’t the Election time yet (pun intended). Let’s pause and think. How many times have we cursed the potholes in a day? My maximum count was 12 on a monsoon morning! No kidding. I blamed the govt, cried on my back luck, pitied people who live in slums, and finally calmed myself saying “Yeh India hai. Yahan toh sadkon se zyada gadde hone hi hai. Kya kar sakte hai ab!” My life, that was disrupted beyond proportion by the inconvenience, as it could have endangered my life, was back to normal in no less than 5 minutes. A billion lives that are disrupted each day on commute because of bad road conditions, eventually calm down by saying “Kya kar sakte hai ab!” Let’s get serious people. A report by the Guardian says that Potholes in India claim more lives than terrorist attacks! We have been losing 10 lives each day because of potholes. Unlike most of us, Gangadhara was not disheartened that his pleas were not heard. Nor did he waste time in any blame game. He chose to be a Doer. Not a Cribber. On an August morning, he himself set out in his car with a bag of gravel and other necessary equipment and material, to spot and fill potholes of Hyderabad. He gradually became addicted to this social service. He’d utilize his office breaks and lunch hours to look for potholes and repair them. However, his job obviously imposed time restrictions for his mission. Such was his drive, that he took voluntary retirement from his job and decided to be devoted full-time to nursing the roads. No points for guessing, he is fondly called as the Road Doctor. Earlier he used the dumped gravel found on the roadside. But as he started filling more potholes, he started spending his own money. He uses most of his pension so that Hyderabad can have safer roads. Since his retirement, every day, he goes out in his car to spot potholes and fill them up. What started with filling that one pothole that splashed muddy water on kids, he has come a long way with more than 1500 potholes and 15+ drains filled. He did not get a lot of support initially. That did not deter him at all. He is a staunch believer of “Be the change you want to see in the world”, which also, by the way, is the motto of his now established organization “Shramadaan” which means, the charity of labour. Never collecting any donation to aid his work, he spent his own scarce pension. He wanted people to come and join him by putting their sweat into the service, not just money. You can judge his simplicity and vision in his appeal to the citizens to come and join him in his noble work, even for one day in a year. Soon, his work started gaining popularity and he received a lot of national and international media coverage. 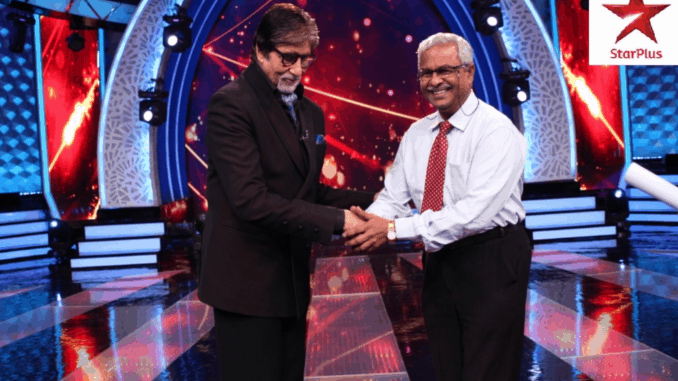 He received an acknowledgment from none other than Mr. Amitabh Bachchan on a reality tv show. Many citizens, inspired by him, have realized their responsibility and joined hands with Shramadaan. From June 2012, even the GHMC (Greater Hyderabad Municipal Corporation) started supplying BT Mix material to Gangadhara. Exemplary examples of good citizenship such as this one are no excuse for the unpardonable negligence on the Govt and the Municipal corporation’s part. In an ideal society, people like Mr Gangadhara should be enjoying his retirement rather than being on a forever lookout to fill potholes. Nonetheless, he is a noteworthy illustration of how we must all play our part in making this society a better place rather than shifting the blame on one entity. One need not go as extreme as Mr Gangadhara to contribute. Just mindful thinking about our country and fellow countrymen in our daily actions will do. Let us all pledge to be the change we want to see in the world. Previous articleCasual Sexism- Invisible Mastermind working against Women Empowerment. Jim Corbett- A Legacy Every Nature/Animal Lover Should Be Proud Of! Dhyan Chand, the Hockey Legend, once rejected Hitler’s offer! Inspiring Story of this Vada Pav Business making 55 cr Annually! EVERYONE WANTS EASY LOW-HANGING FRUITS WITHOUT THE PAIN OF CLIMBING THE TREE AND TAKING THE RISK OF FALLING DOWN. HOWEVER, FOR VENKATESH AND SHIVADAS, THEIR FIRST LOSS ONLY MADE THEIR WILL STRONGER. THEY ARE A CLASSIC EXAMPLE OF WHAT BUSINESS TRULY IS ABOUT- INVESTMENT OF TIME, HARD-WORK, AND SKILLS. Apple and Steve Jobs – long story short. It’s insanely inspiring.